Wikipedia gives the following information about the Cessna 210 Centurion. 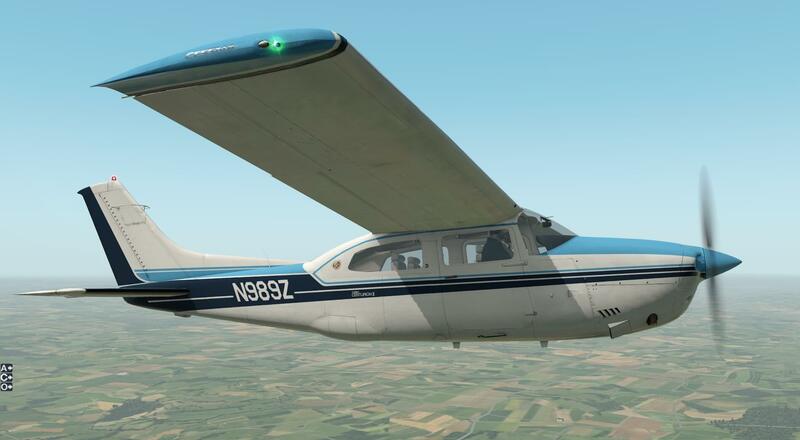 It is a six-seat, high-performance, retractable-gear, single-engine, high-wing, general aviation aircraft which was first flown in January 1957 and produced by Cessna until 1986. The early Cessna 210 (210 and 210A) had four seats with a Continental IO-470 engine of 260 hp (190 kW). 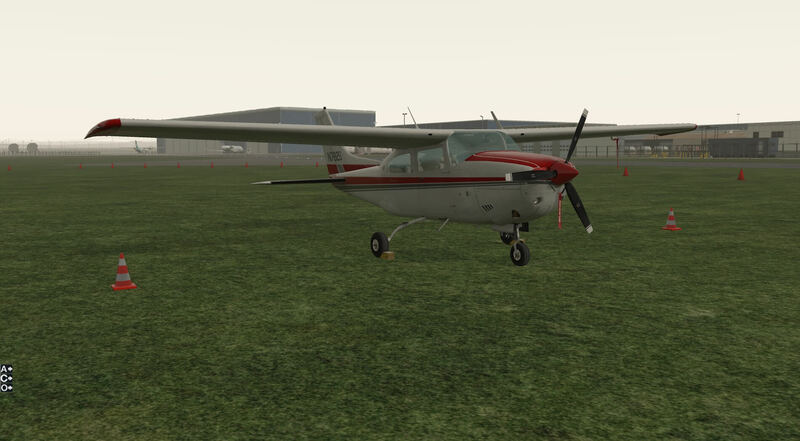 It was essentially a Cessna 182B to which was added a retractable landing gear, swept tail, and a new wing. In 1961 the fuselage and wing were completely redesigned, the fuselage was made wider and deeper, and a third side window was added. The wing planform remained the same, but the semi-Fowler flaps (slotted, rear-moving) were extended outboard, which allowed a lower landing speed. (FAA certification regulations state that a single-engined aircraft must have a flaps-down, power-off stall speed no greater than 70 miles/hour). To compensate for the reduced aileron span, the aileron profile was changed and its chord enlarged. The 1964 model 210D introduced a 285 hp (213 kW) engine and two small child seats, set into the cavity which contained the main wheels aft of the passengers. In 1967 the model 210G introduced a cantilever wing replacing the strut-braced wing. Its planform changed to a constant taper from root chord to tip chord. In 1970 the 210K became the first full six-seat model. This was achieved by replacing the flat leaf-springs used for the retractable main landing gear struts with tapered tubular steel struts of greater length. 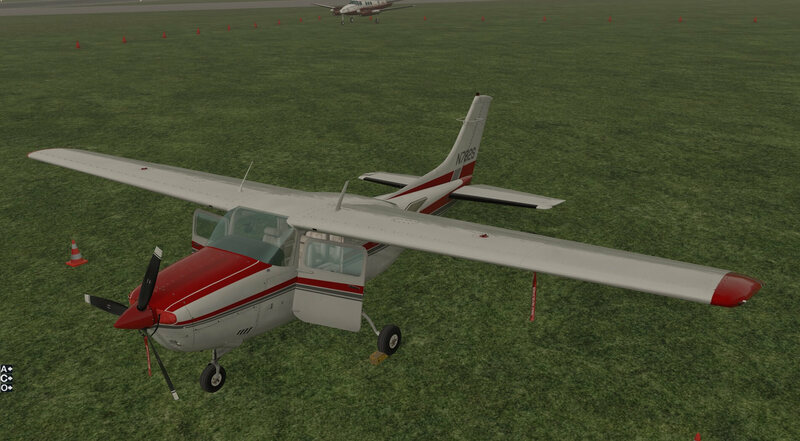 The Cessna 210 was manufactured in 26 model variants. The C210, C210A-D, the Centurion C210E-H&J, Turbo Centurion T210F-H&J, the Centurion II C210K-N&R, the Turbo Centurion II T210K-N&R and the P210N&R. The 210N, T210N (turbocharged), and P210N (pressurised) versions were produced in the greatest quantity. The rarest and most expensive models were the T210R and P210R, which were produced only in small quantities in 1985-86. The main improvement over previous versions in the CT210M Centurion was an optional 310 hp (231 kW) Continental TSIO-520-R engine. These were produced during the period 1977-80 and 1381 were built. 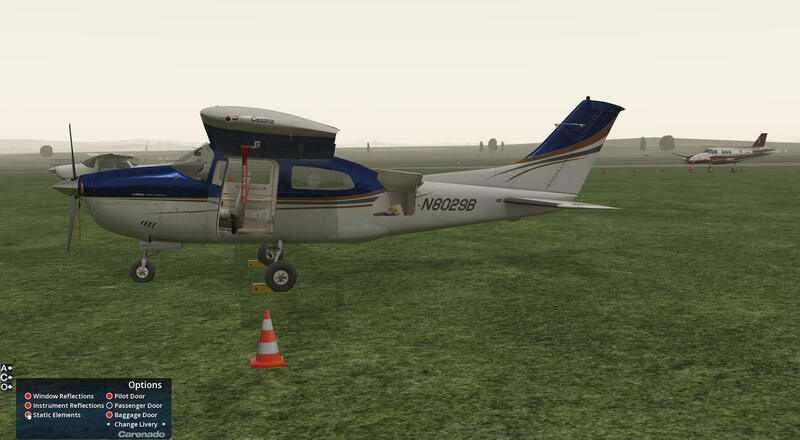 The Cessna 210 is used by flight training schools, private operators and commercial charter firms. The aircraft has military uses with the air forces of Bolivia, Dominican Republic, El Salvador, Honduras, Jamaica, Mexico, Philippines, Panama and Paraguay. Download speeds will vary with internet connection but the process is straight forward and provides a folder containing 22 items. There are no installation instructions and this folder is copied and pasted in to the appropriate aircraft folder in X-Plane. This process is easy to follow. Among the items in the download is the documentation folder which contains seven documents. Three PDFs contain the credits, copyright, version history and modifications up to this version 1.1 of April 2018. 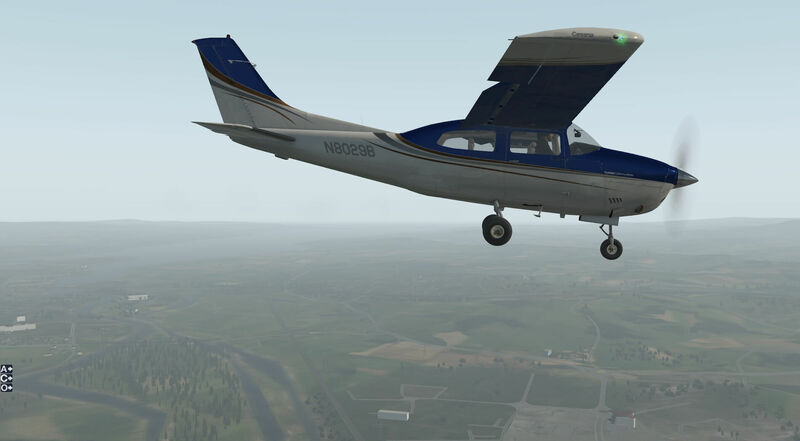 The next document provides recommended settings and how to access the settings menu in XP11. A reference document allows quick views of maximum speeds, weights and climb. A further document advises on the use of the Carenado model of the Bendix/King autopilot supplied with the aircraft and the final document contains normal and emergency procedures, taken from the pilots operating handbook along with performance tables. It should be noted there is no actual handbook for the model within the documentation. 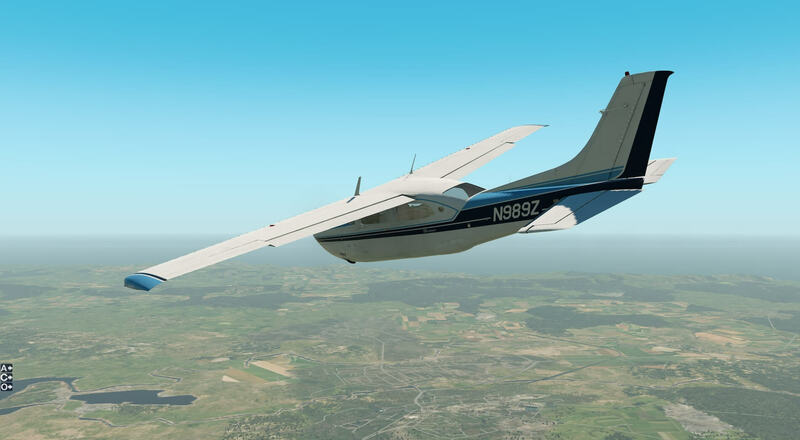 The information provided is extensive and useful but I still feel that a bespoke user manual would add value to the download, especially for those who are inexperienced in X-Plane or, indeed, this aircraft. An example of this would be the absence of a cockpit diagram which would make following the provided checklists much easier for those new to the aircraft. The first line of the aircraft check list refers to the pilots operating handbook (POH) and, because it is lifted form the original document, states a POH can be found in the aircraft whereas in fact there is not one available. 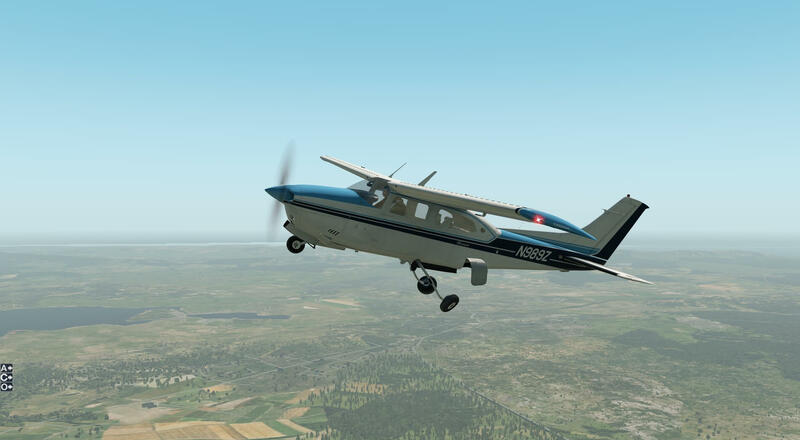 I did find a complete POH for the CT210N supplied for free by redskyventures.org, and whilst this is for a slightly different version of the aircraft, and included the provided checklists, it does add further useful information. The pre-flight check list for an exterior of the aircraft starts with the empennage, tail assembly, so I will follow the checklist whilst reviewing the outside of the aircraft. When viewed from any direction the clarity of the panels and rivets is clear. The surfaces reflect light and scenery in a very realistic fashion and the control surfaces move smoothly. The view towards the rear of the aircraft shows the attention to detail of the model and the view looking in to the rear window of the aircraft includes the glass effect. The checklist moves on to the right wing which carries the same level of modelling and colour. The checklist refers to checking the fuel tank levels manually and whilst this is obviously not possible the fuel filler is modelled. When viewed from the right wing the detail on the fuselage is also visible with lettering and colours appearing clear and precise. Again the colours and light on the panels is very realistic as is the glass texture and reflection is very well modelled. The tyres and undercarriage are detailed including the passenger step on the under carriage strut. The passenger door can be opened using the “O” menu provided in the bottom left of the screen. 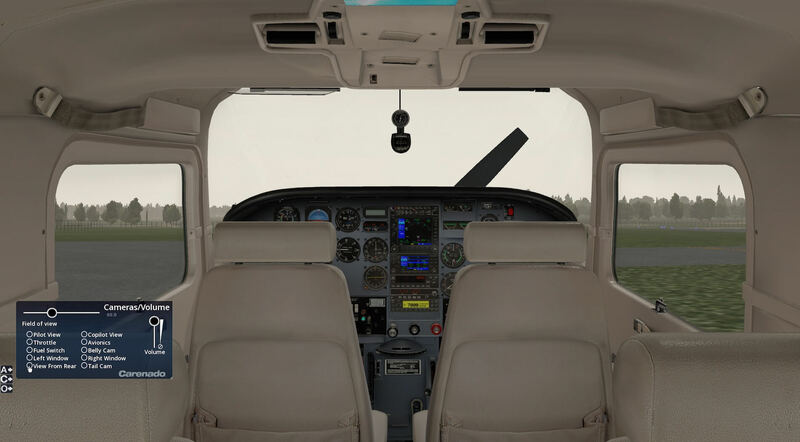 Opening the door allows a clear view in to the interior of the aircraft showing detailed seats, instrument panel and two figures which move independently and realistically. The textures of the door lining and fittings are very well modelled and the wear marks on the exterior and interior of the aircraft are highly convincing. The aircraft comes with six liveries and these can be changed through the X-Plane aircraft menu or through the “O” menu on the screen. Moving to the front of the aircraft with the checklist the spinner is modelled as a shiny surface and this reflects the scenery as expected. The propellers are modelled realistically and the McCauley name labels are legible along with weathering when viewed closely. The “O” menu allows for the addition and removal of static elements including remove before flight ribbons and air intake covers. The removal of the covers allows for air intake checks in line with the check list. 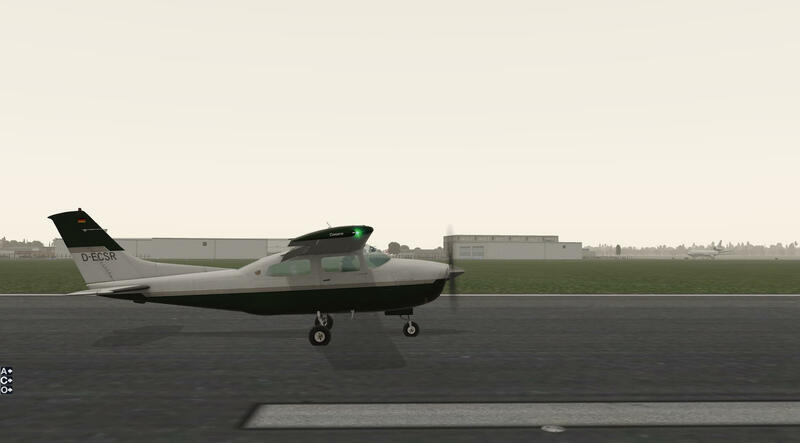 The lights at the front of the aircraft are modelled in detail with deep glass effect and fixings clearly displayed. Again pilot figures are modelled in this view. The front undercarriage and doors are created in detail with wear and use marks on the strut and appropriate weathering on undercarriage doors and the undercarriage mechanism. Further wear can be seen around the exhaust outlets. Completing the external checks from the left wing the lettering and colouring remains clear and legible. 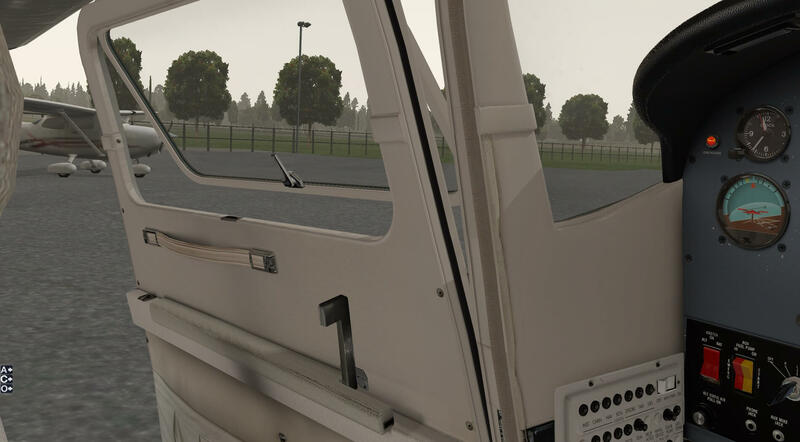 The pilot door can be opened from the “O” menu and this again shows a detailed interior view. The lights and fixings on the external surfaces are modelled as is the left wing filler cap. The baggage door can also be opened and this shows some belongings stowed in the baggage area and a detailed strut to keep the door open. The floor of the compartment is carpeted though there is little internal wear and use marks. 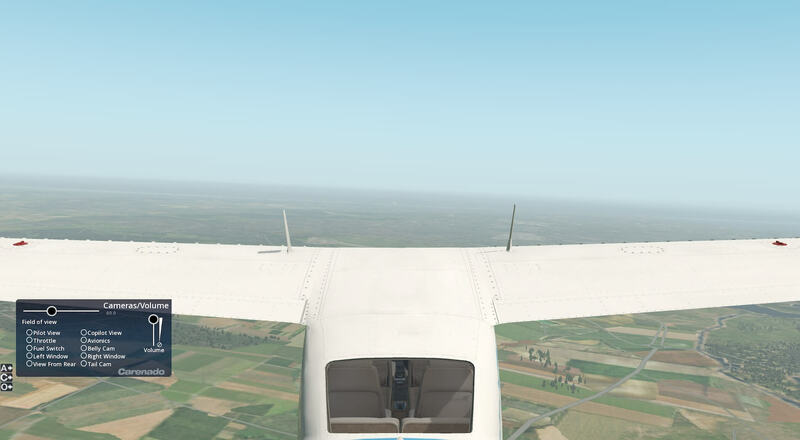 The exterior of the aircraft can be navigated using the X-Plane view menu or using the “C”, camera, menu in the bottom left of the view and this moves the view quickly to internal views and then a belly cam or tail cam. These can be used in flight or on the ground. In flight the modelling of the aircraft becomes more apparent than on the ground, and lighting and reflections are used cleverly to produce detail and texture. Shadow and reflection behave as expected and the views in to the aircraft remain clear and detailed. The livery appears bright and the lettering on the panels is still crisp. The external modelling on this aircraft is detailed and precise. Colours, light and reflection add to the realism, as do the panels and aircraft equipment that are modelled. The standard is maintained from all angles and detail is evident throughout. The control surfaces and undercarriage fittings and doors are very realistic and show the slightly unusual method of retracting the main gear creating more space in the cabin. A very impressive aircraft when viewed externally. 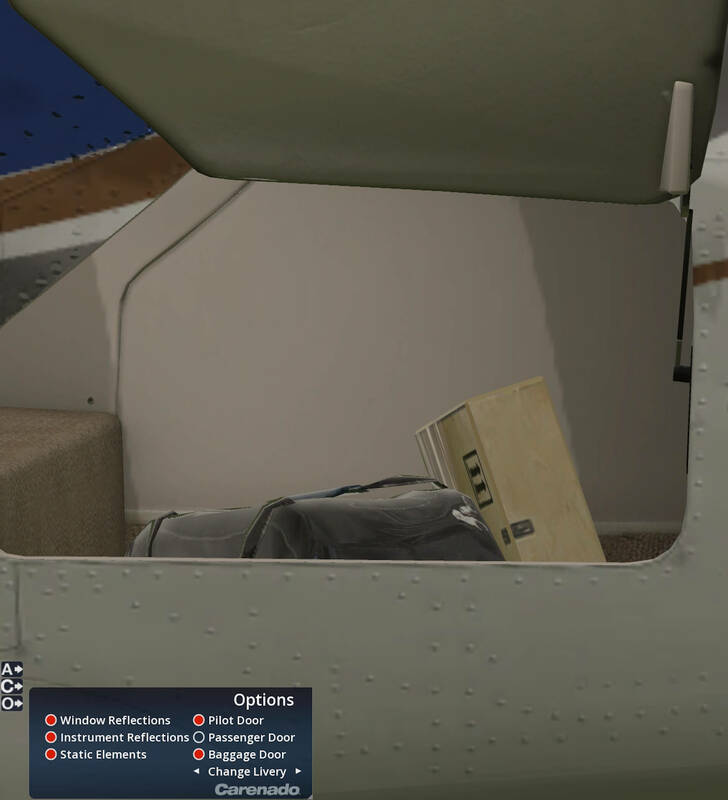 The detail and realism continues inside the aircraft. The instrument panel is clear and modelled in detail with dials and instruments legible at any level of zoom with some helpful arrows to indicate switch and dial use and some labelling of switches and levers where their use is less obvious. Less experienced pilots may benefit from a few more labels although the actual instrument panel lettering and signs helps towards this. The yokes can be hidden by clicking on the base of their fitment to the panel. Textures of surfaces and fabrics are realistic and well modelled throughout with light and shadow effects creating a convincing experience and even the edges of the glass on the moveable sun blinds reflects light correctly. The fabric lining and seating material has modelled stitching and zips all done in great detail and screw heads are accurately presented. Windows and doors can be controlled with their own handles and open in a smooth, controlled manner. 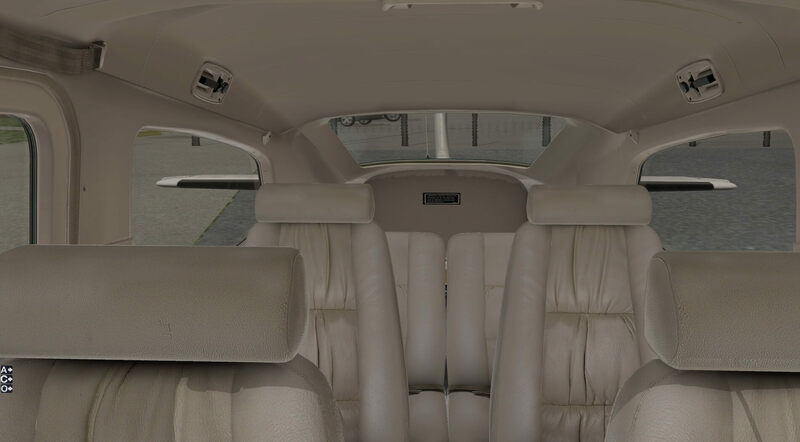 All surfaces have appropriate weathering with foot marks on the carpet and seat covers showing signs of use and wear marks on the instrument panel. Moving back through the passenger cabin the detail remains of a high standard and the four passenger seats match the appearance of those of the pilot and co-pilot with belts, hand grips and carpet having detailed textures. 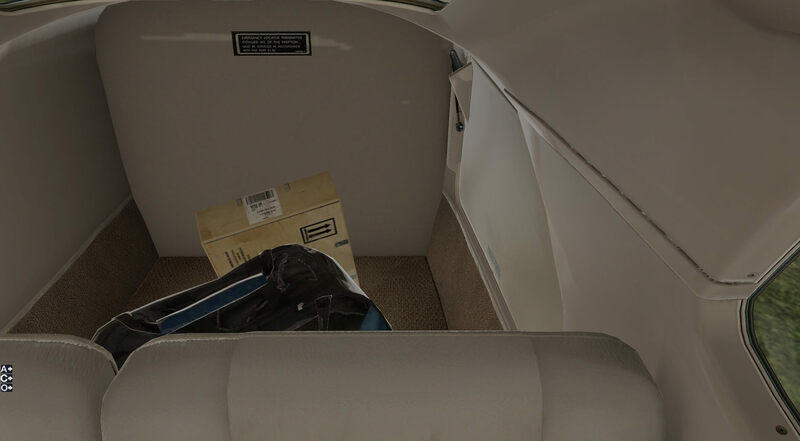 The luggage area, visible through the baggage door from outside the aircraft, is visible over the rear two seats. Views from the rear of the aircraft looking forward show that the instrument panel remains clear and visible even from a distance. The modelling creates a cabin that appears well maintained but used. 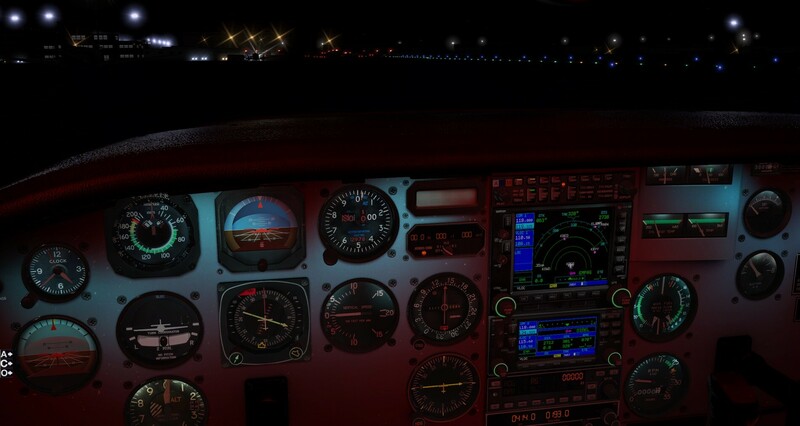 The lighting effects in the cockpit are very good and the instrument panel looks impressive at night. Working through the pre-flight checklist for the interior of the aircraft would be easier if a cockpit diagram was provided bespoke to this aircraft. Photographs viewed on the internet of the instrument panel show numerous configurations and different fitted equipment so diagrams from elsewhere are not totally relevant. For example the cockpit diagram, in the downloaded POH for the 210N, was not totally accurate, as expected, and therefore the model, an aircraft used for training, becomes more difficult to learn on. 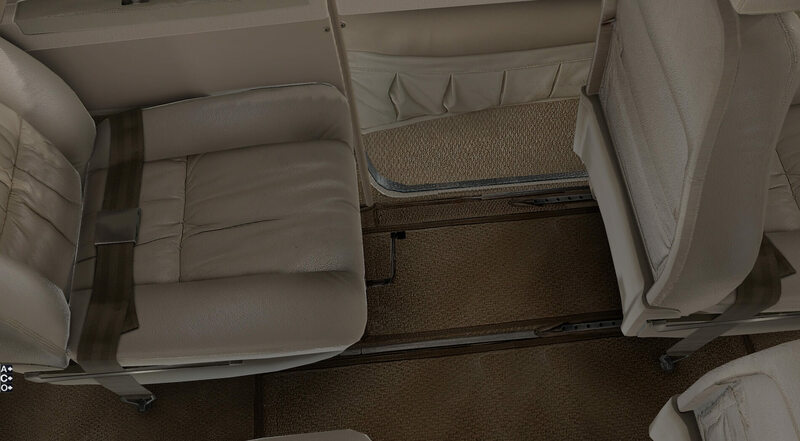 The interior of the aircraft creates a realistic atmosphere and a convincing flight experience. All textures, materials and moving parts work together to produce a high quality model. 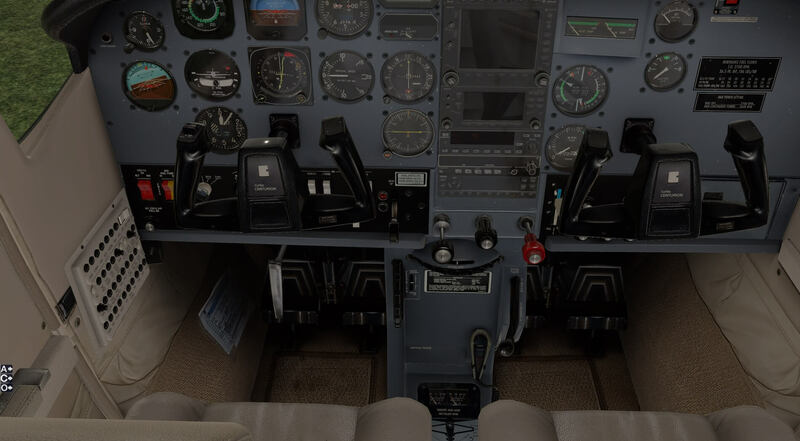 The views around the aircraft interior can be achieved via the X-Plane View menu or visa the “C” Camera menu which enables immediate access to Pilot, Co-Pilot, Throttle, Avionics, Fuel Switch, Left Window, Right Window and from the rear of the cabin. This menu helps achieve those views quickly and is really helpful when in flight, especially for the less experienced pilot who will not know where to look instinctively for these things. The model has its own menu system to facilitate moving around the aircraft and equipment. As mentioned earlier the access to this menu is in the bottom left of the screen under the letters “A”, ‘C” and “O”. The “A” menu pops out the Bendix/King autopilot so it is easier to use. The “C” Camera menu covers the views mentioned in the above paragraphs and also controls the field of view and the sounds volume of the model. 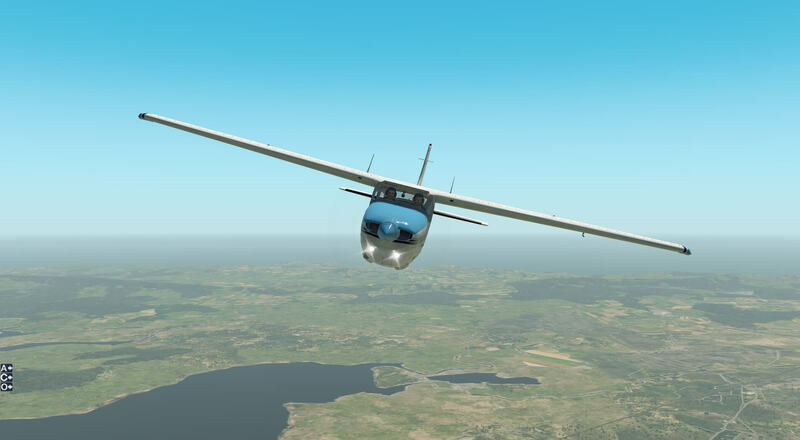 The “O” Options menu covers toggling Window Reflections, Instrument Reflections, Pilot Door, Passenger Door and Baggage Door as well as a quicker way to change aircraft livery than going through the X-Plane customise options. 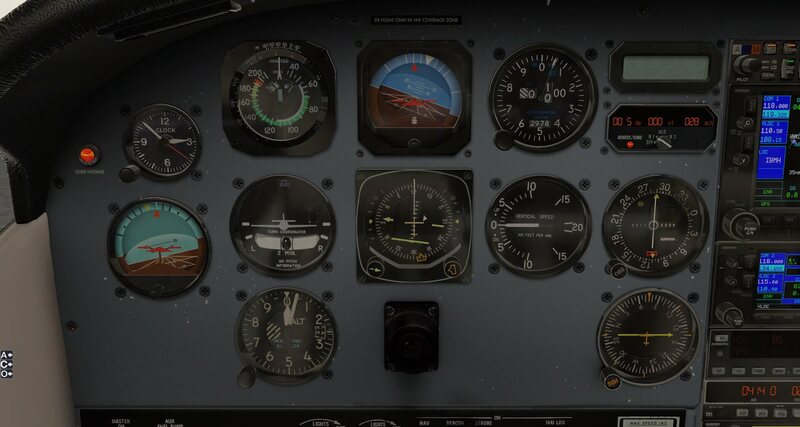 The instrument panel consists of standard instruments along with a radio altimeter. The heading indicator is presented as a Horizontal Situation Indicator which combines a heading indicator with a VHF omnidirectional range-instrument landing system (VOR-ILS) display. This reduces pilot workload by lessening the number of elements in the pilot’s instrument scan to the six basic flight instruments. On the HSI, the aircraft is represented by a schematic figure in the centre of the instrument – the VOR-ILS display is shown in relation to this figure. 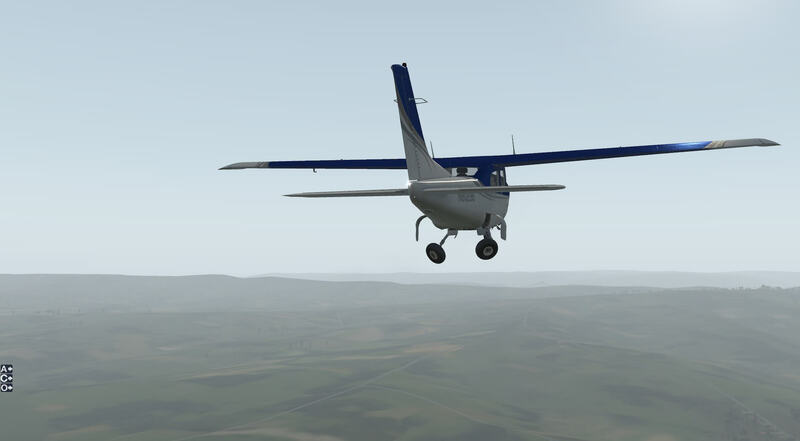 The HSI is interconnected with the autopilot which is capable of following the heading select bug and of executing an ILS approach by following the localiser and glide slope. 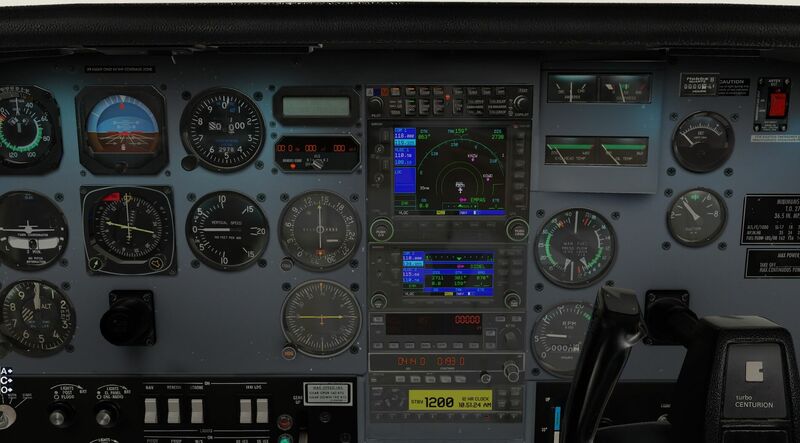 A Flight Director Indicator sits to the lower left of these instruments with the option of changing the indicated rate of climb. The instrument display includes an auto-pilot read out, a DME Display modelled on the Bendix/King KDI 572 providing a simultaneous readout of distance, groundspeed and time-to-station, a CDI and an ADF. This is a comprehensive suite of instruments and navigation aides and the pilot has a lot of assistance once the systems are understood. The avionics stack has a communications panel allowing control of which communications device can be heard in the cockpit. The aircraft is also supplied with models of both a Garmin GNS 430 and a Garmin GNS 530. Both systems provide all in one GPS/Navigation/Communications and work in tandem with the autopilot to allow the aircraft to follow flight plans and map the location of the aircraft showing airports and navigation aids. The aircraft defaults to the GNS 530 when routes are input by plug ins such as Goodway and when flight plans are followed and radios are tuned. 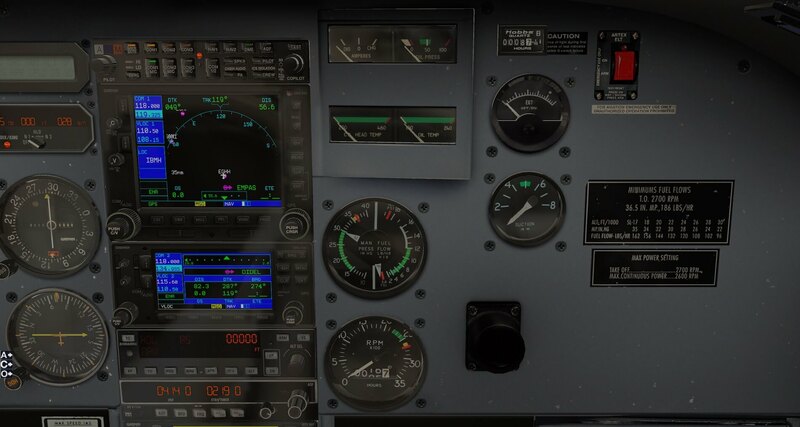 I enquired with Carenado if it was possible to switch off the GNS530 or make the GNS430 the primary equipment, for training purposes or to simulate a failure, and they have informed me that in X-Plane the software needs to “know” which is the primary system and so to change priority is not possible. This is not an issue, nor does it detract from the model, but I felt it worth mentioning to prevent others trying to do it. The next item in the stack is modelled on a Bendix/King KR87 and this gives a bearing to station with the ADF and allows switching between active and standby frequencies. The final item of the stack is a transponder modelled on the Garmin GTX327. Once the avionics master switch is turned on the pilot would normally press the “”ALT” button and this turns on the transponder. Should the pilot not wish to turn on altitude mode simply press the “ON” button. There is a “STBY” button which switches on the transponder but inhibits the GTX 327 from replying to interrogations. To turn off the transponder simply press the “OFF” button. Along the bottom of the transponder faceplate are the digits 0-9. If ATC gives you the code of 2-3-4-6, simply press those keys and the display will change to that new code. If you make an error while keying in a code, just press the “CLR” button and the cursor will move back to the prior digit and you can correct it. Press the “VFR” button and the code will automatically change to 1200. Pressing the “FUNC” button changes the pages shown on the right of the display. Displayed data includes Flight Timer, 12Hr Clock, 24 Hr Clock, Date and Zulu (UTC) Time. Both the Garmin GNS 430 and 530, the autopilot and the transponder all “pop out” so they can be used more easily. Given the equipment in the instrument panel and the comprehensive fit of avionics the developers have given the pilot a large amount of systems for an aircraft of this size. The integration and usefulness of the systems is very impressive and the effort put in by the developers creates potential for new pilots to learn many aviation systems and an experienced pilot to use their skills in many different forms of navigation. The model is provided with a very convincing sound package. 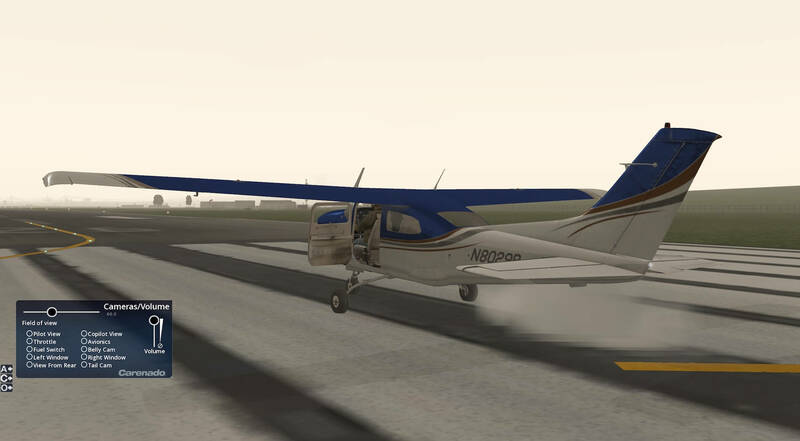 Engine sound is realistic and the volume and tone changes appropriately with throttle changes and moving inside and outside the aircraft. The sound surrounds the pilot in the cockpit. Door and window catches have their own sounds and, again, engine volume changes when they are opened. All switches and dials have their own positive sounds which confirm their operation. Control surfaces can be heard moving and the undercarriage gives a reassuring thump when going either up or down. Ground noise from tyres is modelled and the brakes can be heard when applied. When in flight the sound is immersive and adds to the experience and wind noise provides even greater realism. 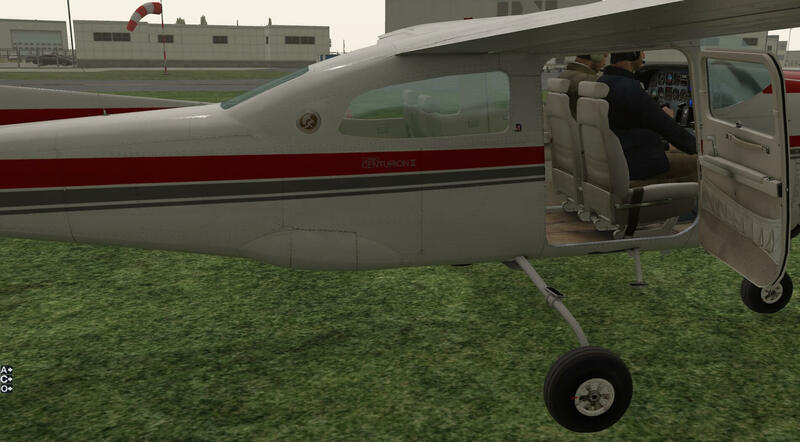 The developers have complimented the attention to detail in the model with a quality sound package which provides a great flight and also feedback as to how the aircraft is being flown. This is a good aircraft to fly simply loaded at the end of the run way with engines running. 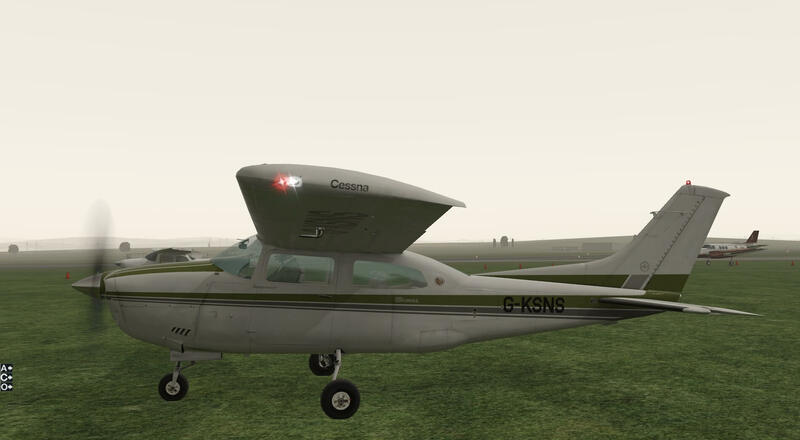 It is not surprising that it has similarities to the default X-Plane Cessna 172 but is clearly a different aircraft. 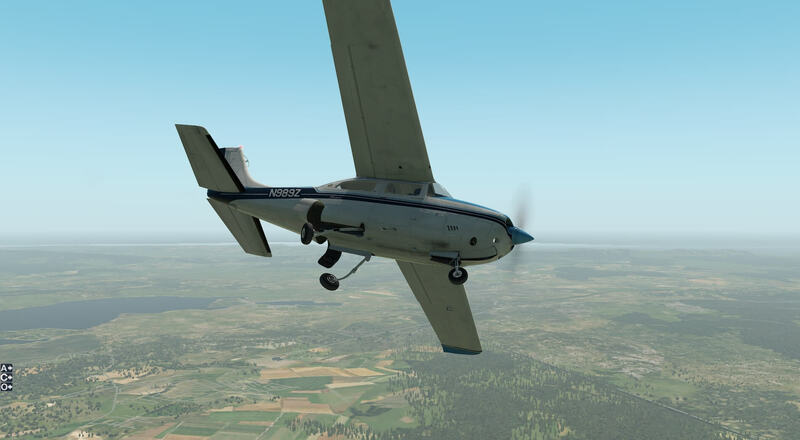 The aircraft can be flown without going through any procedures and used to enjoy the X-Plane scenery and systems without very much experience. To this end it is a good training aircraft for beginners but, as mentioned before, learning would be easier with a manual and especially a bespoke cockpit diagram in the documentation. The aircraft flies well at low speeds so again a landing made without the correct procedures is possible so the whole flight can be made just to enjoy the aircraft. Starting from cold and dark and having completed the preflight exterior and cabin checks from the checklist I continued on to prepare for engine start. I prepared a flight plan for a short flight between two local airports. I followed the procedure and opened the cowl flaps, checked the brakes, ensured the landing gear lever was down, checked the circuit breakers and switched the fuel tank selector to the fullest tank, checking also that there was enough fuel for the flight. The avionics power switch, found on the avionics power panel on the pilots door, has to be off at engine start to prevent damage. The auxiliary fuel pump can be switched on and is accompanied with the appropriate sounds. The engine is started by the key to the pilots left and this worked after two attempts. I continued to follow the checklist and ensured fuel flow was at 60lbs per hour which can be checked in the dial on the co-pilots panel. The sounds for engine start to engine running are very realistic. Taxiing was straight forward with the aircraft being very responsive to steering input. The realism continued with differing ground noise as the aircraft moved from grass parking to tarmac. 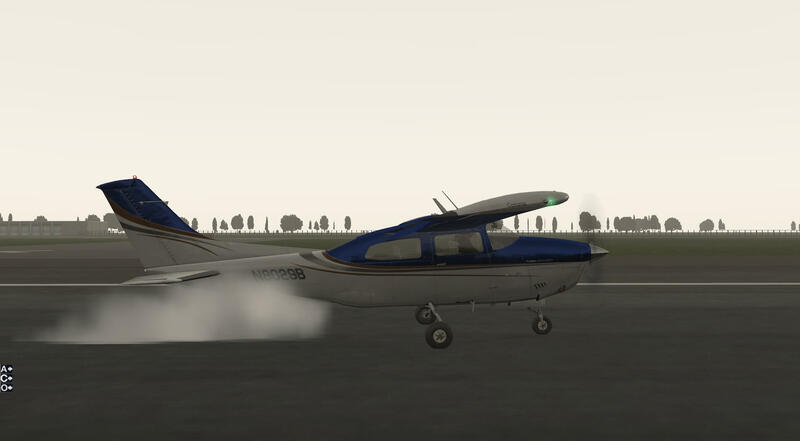 On arrival at the end of the runway the aircraft braked as expected and I continued with the checklist and completed safety checks such as doors and windows locked and flight controls free and moving. The fuel tank selector switch can be moved to ensure the fullest tank is chosen and the mixture lever is modelled so I set the mixture to rich and checked the magnetos by turning the ignition key to L and then R. Having seen very little drop in RPM I checked the ammeter and suction gauge as outlined in the checklist. These are available on the co-pilots panel. With all in order I switched the avionics power switch to on and the avionics responded immediately. In line with the real equipment I had to switch the transponder to “ALT”. I ensured the flight plan was installed in the GNS 530. Having checked the radios were set I switched on the external lights of the aircraft and released the brake. I set the flaps as required and followed the checklist for take off. Take off was smooth and the aircraft responded well to inputs. 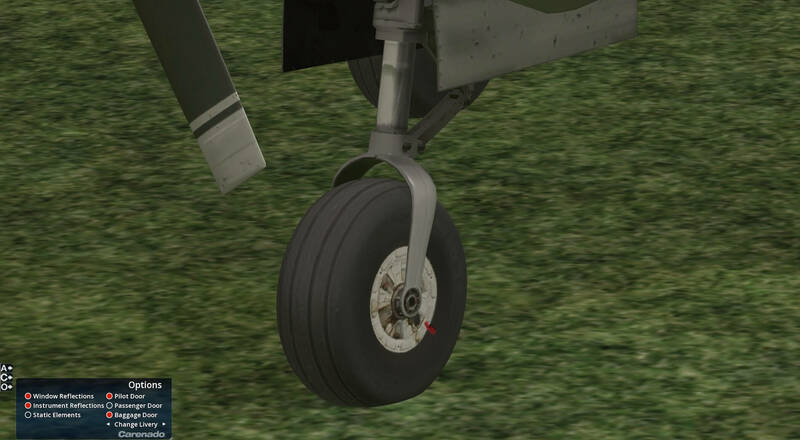 I lifted the nose wheel at 65kts and the aircraft climbed as expected allowing me to retract the undercarriage and flaps. 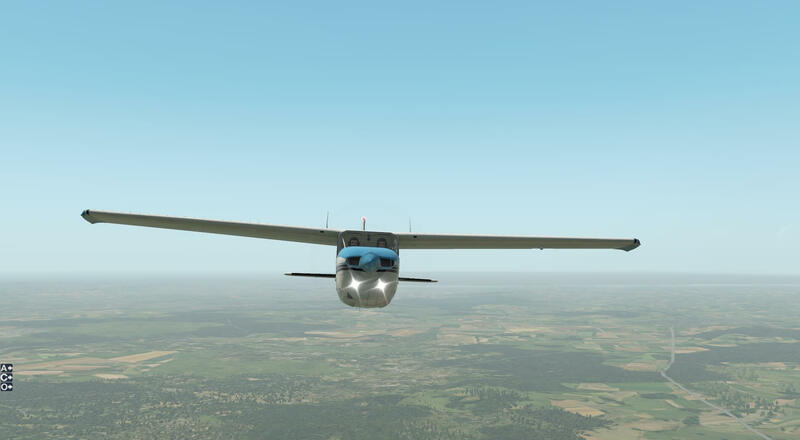 I switched on the autopilot and set the engine at the recommended settings after the climb, though I did have a problem increasing fuel flow, and closed the cowl flaps. I switched on the autopilot in to Nav mode and the aircraft responded immediately, I set a rate of vertical speed and the CDI on the GNS530 to GPS. 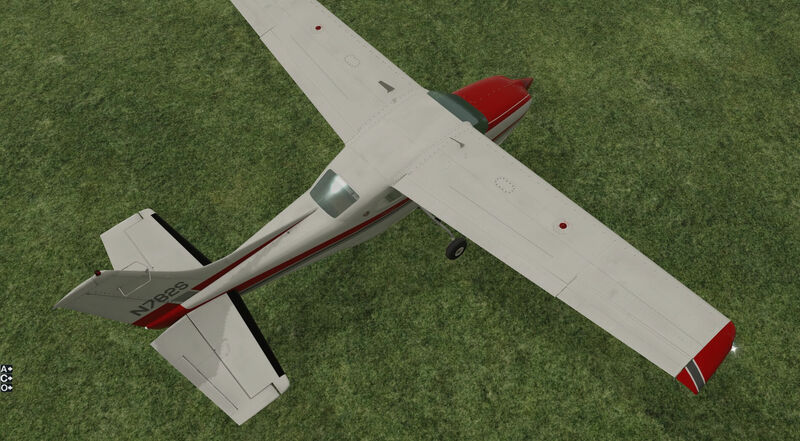 The aircraft turned and responded smoothly and I was able to enjoy the X-Plane scenery. The flight was very enjoyable with the aircraft responding as expected to inputs and changes, with the sounds adding to the experience. I did not use the other navigation equipment on this flight but the Flight Director showed the autopilot was handling the aircraft as required. On approach to the arrival airport I set the radios and started the descent, carrying out the checklist as required. The undercarriage went down with an appropriate sound and this was the same for extending the flaps. 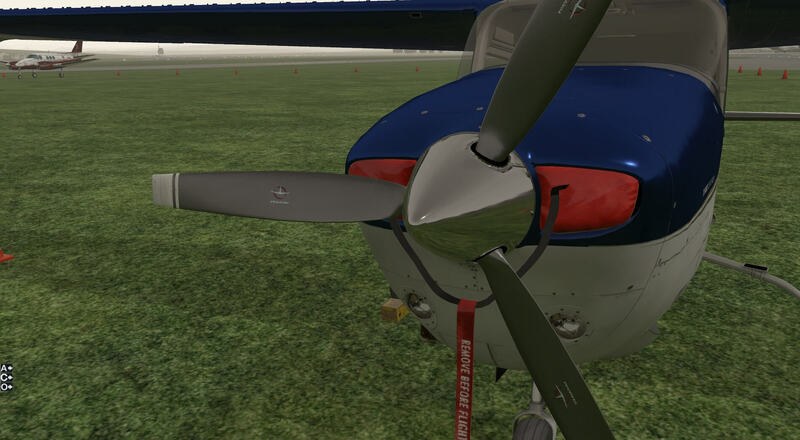 The fuel selector was easy to move to the fuller tank and I set the mixture to rich and the propeller at high rpm. About five miles out I switched off the autopilot. The DME and the GNS530 indicated my distance to landing and the time to the destination. The aircraft responded well to inputs from the controls and landed well. 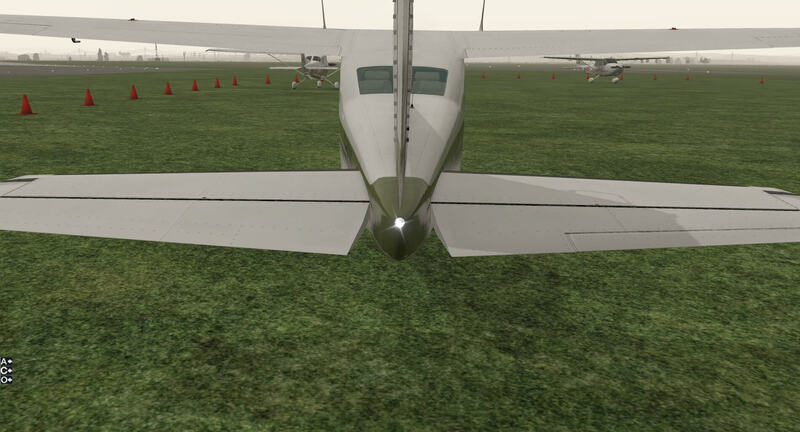 I retracted the flaps as per the checklist and opened the cowl flaps before taxiing to park and securing the aircraft. Whilst I am sure other pilots would have flown the journey far better than me this was a great aircraft to fly. The systems all integrate well and the aircraft responds well to inputs either made manually or by the autopilot. The aircraft feels a little more stable than the Skyhawk and its extensive set of systems certainly help the pilot. The model creates a good aircraft to learn in, as a forgiving platform, both for the new pilot and for those wanting to learn or practice different navigation techniques. 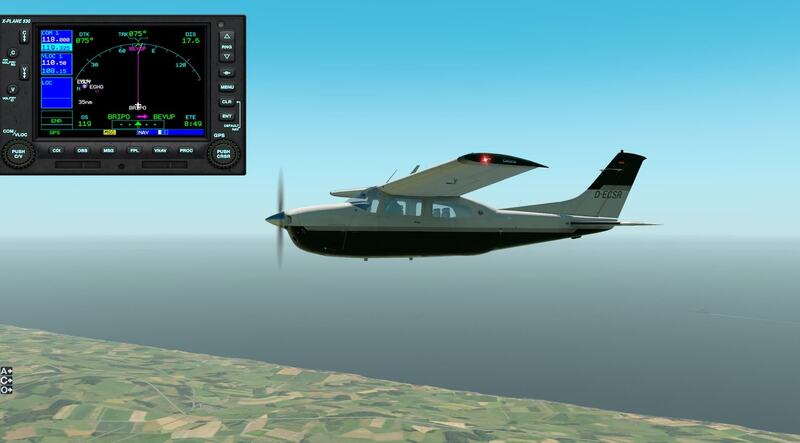 Having never flown a real CT210M I cannot comment on whether the model flies in a similar fashion to the real thing. I can say this is a highly detailed model and is impressive in both its internal and external appearance and its sound package. The attention to detail is very high and the aircraft has many working parts and equipment. 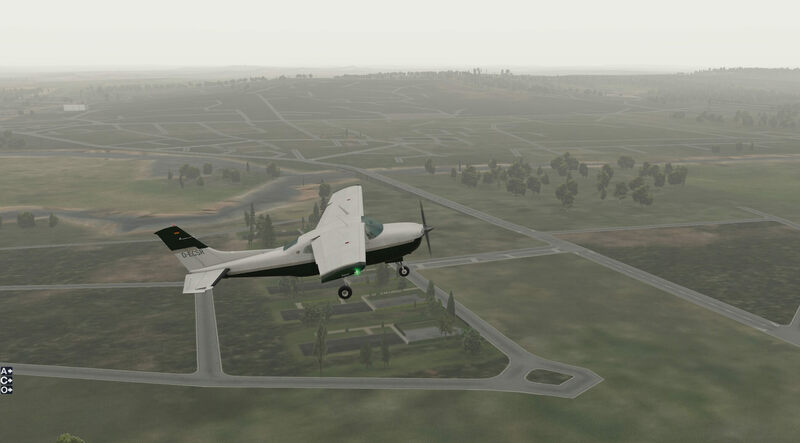 The selection of navigational tools and avionics is large and varied and the combination of this with a realistic model provides a new pilot with an aircraft that is easy to fly and enjoy and those with more experience the opportunity to hone various navigational and flying skills. Carenado have produced a user friendly but convincing version of the Centurion II. 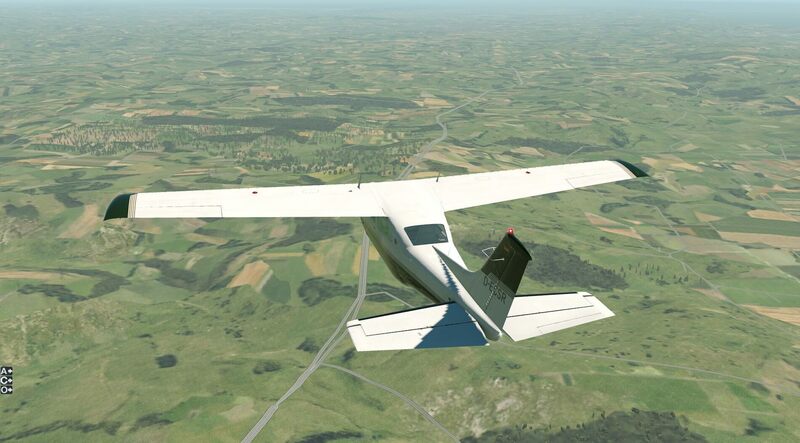 More information can be found at the Carenado website or you can have a look at the dedicated X-Plane.Org store page.